Charlotte’s first blogging conference had ended. On the day of the conference, we had 120 attendees. Tell us what you loved, hated, and secretly mocked. Or just build our egos a bit, your call. The official Charlotte WordCamp 2008 Feedback Survey. Still more video to come, just posting some snippets as they get uploaded. Video by @jakrose, Corey Creed can be found here. Much more video coming. This is just a sample. Thanks to Stormncast on Twitter for video. At the beginning of CLTwordcamp, the 120 person audience was asked “Who doesn’t know what Twitter is?” It had already come up in conversation a few times. 1 person raised her hand. I am sure there were a couple other shy folks, but to say the least, Twitter was represented well at the conference. 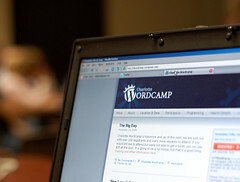 Here is the CLTwordcamp tag on Twitter. Ben Ullman also wrote a good post on his interaction with other Twitter users at the event. We’re almost halfway through CLTWordCamp , the morning started off with short 20 seconds introductions from the entire room, that went surprislly fast & well. Then we broke up into two sessions, 1. a WordPress for Beginners and the others had an open discussion (camp style) on wordpress. We just finished our session on Technical & Design of WordPress and now it’s lunch time. Of course to follow the conversations do a search on #CLTWordcamp using search.twitter.com.